“Toy Story 3” is the oddball among this year’s best picture nominations: it’s the only animated film, the only G-rated film, the only sequel and the only one primarily aimed at children. 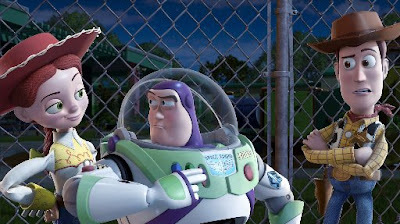 Nonetheless, the Pixar comedy found universal favor among grown-up audiences, with perhaps special resonance for those who were children when the first “Toy Story” movie came out in 1995. In “Toy Story 3,” Woody the cowboy doll, Buzz Lightyear and the gang must cope with the passing of time: Andy, the child who once played with them, is going off to college, and the toys, mourning the loss of their friend, must contemplate a scary new life at a day-care center. It’s a sweet and artful film, though I think not quite at the level of the first two (or of Pixar classics such as my favorite, “Up”), and while it hasn’t a chance at the big prize, it’s sure to take home the animated-film award. Total U.S. box office: A massive $415 million, leading all movies for 2010. Total Oscar nominations: Five, for best picture, animated feature, adapted screenplay, sound editing and original song (“We Belong Together” by Randy Newman). Best chance for a win: Right after Colin Firth, the surest thing in this Oscars is “Toy Story 3” winning best animated film (though there’s definitely support for “How to Train Your Dragon” and “The Illusionist”). Newman could well pick up his second Oscar (though he’s been nominated 20 times, famously winning on his 16th try) for “We Belong Together” — OK, I don’t remember the song, but I don’t remember any of the nominated songs, so there you go. The other nominations are the longest of long shots. Odds of this movie creating any fabulous Oscar-night weirdness: Well, if it won best picture, it would be the first animated film to do so and would cause quite a stir — but you can count on that not happening. Otherwise, short of Newman making a funny speech (on his previous win, he grinned and said “I don’t want your pity”) or animated characters storming the podium, don’t expect too much Pixar-related excitement. Where I’d rank this film among the 10 Best Picture contenders: 10. Sorry. They’re all good.